We can learn a lot from our patrons. One of our regulars spends most of his time surfing the internet and then copy/pasting things he likes from web pages and email messages into Word files. He carries around four or five flash drives, and his Word documents can sometimes be 200+ pages long. And of course, he runs into problems. 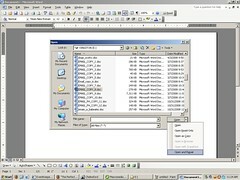 He called me over the other day, because he was seeing an error when trying to open one of his files. I had never seen it before, but (surprisingly) it gave very clear instructions on how to fix the situation - using something in Word that I had never noticed before. 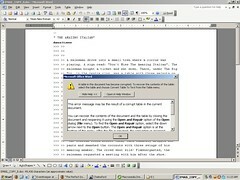 The problem is that, when he copies things from a web browser, Word doesn't just copy the text and images. Word copies all of the underlying HTML code, too, and tries to recreate the tables. The chance of copying all of the necessary code is very slim, so when the file is saved and reopened, Word says the tables are corrupt. After I walked through this with the patron, he's been able to do it himself, and is very happy. But the real fix might be to install the Copy Plain Text add-on for Firefox on our public computers and show him how to avoid the problem all together.